We have moved to an open development paradigm using GitHub, which means users and developers are no longer required to submit requests for usernames and passwords to access our software package. The WAVEWATCH III® project page is here. The latest release (currently at 6.07) is available as a compressed tarball or zipfile from the project page. If you are a user and would like to access the code for applications and do not plan to engage in development work, see the User Guide. If you are a developer and would like to add a new feature to the code, see the Developer Guide. The WW3 GitHub wiki hosts a description of the model, its main features, output options, user and developer guides, technical documentation and latest news. 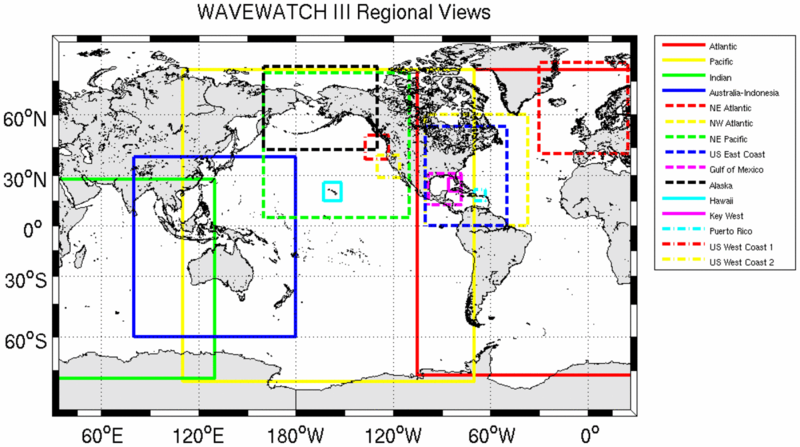 The operational ocean wave predictions of NOAA/NWS/NCEP use the wave model WAVEWATCH III® using operational NCEP products as input. The model is run four times a day: 00Z, 06Z, 12Z, and 18Z. Each run starts with 9-, 6- and 3-hour hindcasts and produces forecasts of every hour from the initial time out to 120 hours, and then forecasts at 3-hour intervals out to 180 hours. The global wave model consists of global and regional nested grids. As background information, a list of selected references and a chronological list of model changes are available. Finally, validation data are available for the multigrid model. 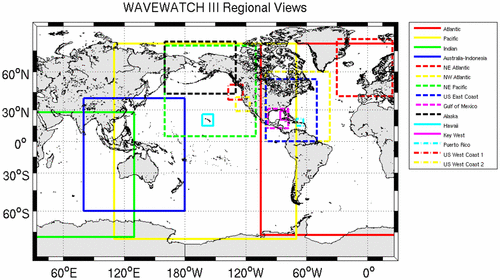 MMAB currently maintains two classes of WAVEWATCH III® hindcasts. A thirty-year hindcast generated from the NCEP Climate Forecast System Reanalysis and Reforecast (CFSRR) homogeneous dataset of hourly high-resolution winds. The time period covers from 1979 through 2009. This is a true hindcast generated with a single version of the model and a statistically consistent forcing wind field, and is suitable for use in climate studies. An ongoing data set produced by rerunning the model from the operational wind fields to produce best-estimate nowcast datasets. This is a statistically inhomogeneous hindcast data set, because the underlying models are periodically updated. Therefore this data set should not be used for climate studies. Registration is free for the courses. While WAVEWATCH III® is an operational model, we cannot guarantee the timeliness or accuracy of the model data and figures offered on this site. Please see our disclaimer for more information. We welcome any questions or comments you may have on the WAVEWATCH III® system. Sign up for the MMAB mailing list for updates and information on these products. For questions or problems with the website please contact us.